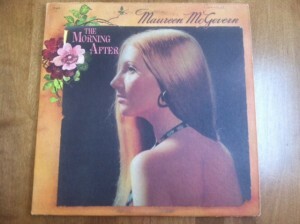 The album “The Morning After,” by Maureen McGovern, was released in 1973. One of the enjoyable aspects of starting a vinyl collection well into adulthood is the thrill of the hunt. That is, as long as some jamoke named Conrad doesn’t mess up the experience. I like to go to the various used records stores in my part of the world – suburban Philadelphia – and spend some time rummaging through the endless discount bins for certain albums. Usually, I’m looking for an album that I’m writing about, either one that appeared in The Vinyl Dialogues or one that’s going to be featured in The Vinyl Dialogues Volume II. It’s a relaxing way to kill and hour or two on the weekend, if one has the patience – as well as a good back and legs – to stand there and sift through album after album looking for that buried treasure. This album used to belong to somebody named “Conrad,” who felt it necessary more than 40 years ago to sign it. Morning After” by Maureen McGovern. 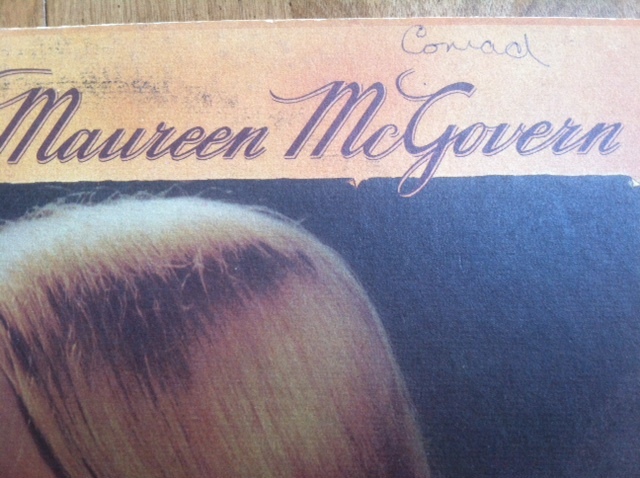 I had interviewed Ms. McGovern for an upcoming show she was doing in New Hope, PA, and during that interview, I gathered enough of her recollections to make a chapter about the album for The Vinyl Dialogues Volume II. So off I went to The Rock Shop in Plymouth Meeting, PA, which has a nice selection at reasonable prices. Another thing I like about going to used record stores is that – to nobody’s surprise – there’s usually a turntable playing records, which provides a soundtrack for the search. On this day, the classic album of choice was “Before the Flood,” by Bob Dylan and The Band, a live album recorded during a 1974 American tour. That’s a really good choice for perusing vinyl. I went through bins of records for an hour-and-a-half. Among those I pulled out was one that I hadn’t yet found from The Vinyl Dialogues, “Tarkio” by Brewer and Shipley from 1970; two from Hall & Oates, “Along the Red Ledge (1978) and “X-Static” (1979); two from America, “Heart” (1975) and “Hideaway” (1976); “Golden Bisquits” by Three Dog Night (1971); and “Whistling Down the Wire” by David Crosby and Graham Nash (1976). Even though I found albums from just about every female singer-songwriter of the 1970s – Carole King, Carly Simon, Janis Ian, Phoebe Snow, Linda Ronstadt, to name a few – I didn’t find Maureen McGovern’s “The Morning After. I was just about ready to call it a day, when in the last row of records I was searching, nearly at the back, there it was! “The Morning After” by Maureen McGovern. It was indeed like finding a buried treasure, and I immediately broke into my happy dance, which resembles the Snoopy Happy Dance from the “Peanuts” cartoons, but with much less grace and rhythm. I am not opposed to doing that in front of other record store patrons when I find the elusive vinyl. If anyone were to ask what was wrong to me, I was prepared to tell them that I was just rocking out to Dylan and The Band. Once that moment of finding the proverbial needle in the haystack elation subsides, though, then I usually take a closer look at the record and the album cover. Which is what I did this time as well. Now it’s not unusual to find records with people’s names on them. There was a time – and I understand this – as kids where we put on name on our most valuable possessions. This album, likely more than 40 years ago, apparently was a prized possession for someone named Conrad. There is no way for me to know if that is a first name or a last name, but my immediate reaction to finding Conrad’s name on the very album I had been searching for was to seek out the first person named Conrad I could find and punch him right in the nose. WFT Conrad? Did you not know 40 years ago that someday I would find this record, with the hopes of having it signed by Maureen McGovern? Of course, that is an unreasonable reaction. But it did take a bit of the steam out of the Snoopy Happy Dance once I came to my senses. I bought the record anyway. One never knows how long the search would have continued to find the album again. This is one is in pretty decent shape, and will look cool once it’s signed by Ms. McGovern. That will be the second autograph on the album. Thanks, Conrad.